CBBC is bringing back Horrible Histories in a big way, with both a movie and an eighth series of the TV show being announced. Casting for both projects is yet to be announced, but we’d expect the usual generous selection of British comedy talent. Horrible Histories series 8 is filming now, with the educational sketch show’s return to our screens being planned for somewhere around the midpoint of 2019. As for the movie, production is underway and behind-the-scenes talent has been assembled. Jessica Swale is writing the script, having previously penned the Oliver-winning play Nell Gwynn, the upcoming Gemma Arterton movie Summerland and that comedy sketch that went viral named Leading Lady Parts. Dominic Brigstocke, who has directed 22 episodes of the TV show, will direct this big screen rendering of Horrible Histories. He also has Tracey Ullman’s Show, Green Wing, Smack The Pony and I’m Alan Partridge on his directorial CV. 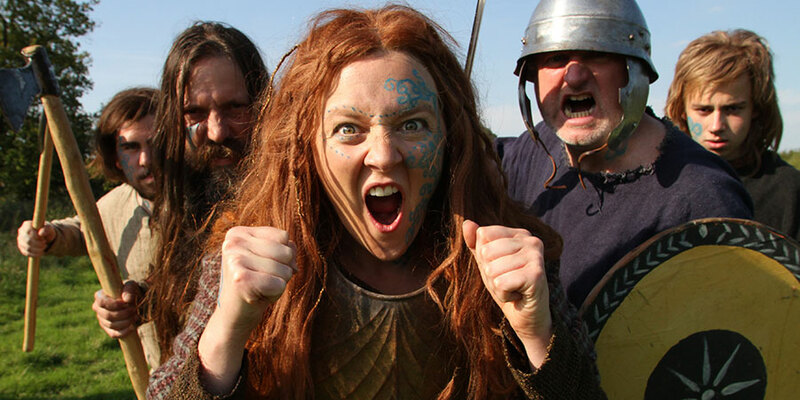 According to British Comedy Guide, the Horrible Histories film will focus on Queen Boudica, who led a revolt against the Roman occupation of Britain in the first century AD. Lorna Watson (pictured centrally in the image above) previously played the role of Boudica in an episode of Horrible Histories series 6, but it’s unclear if she’ll reprise the role here. The Horrible Histories film is expected to have two teens at the heart of its story, and it could be aiming for a release towards the end of next year.